Chances are your organization is probably either in the midst of a technology change, or planning one. 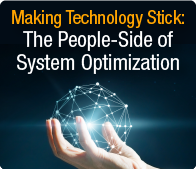 Do you know what it really takes to achieve system optimization for the investment? Software and hardware costs are just the beginning! In fact, most technology fails to deliver on time, on budget, and to spec, all that is promised by vendors. Not because of the technology itself, but because our organizations focus solely on getting the technology launched, rather than getting it fully implemented to system optimization.